Recently a friend was having trouble with his Model T running correctly and we traced the trouble to the timer. Prior to this he was running a True Fire or some such modern replacement ignition. This set up failed and we went back to a coil/timer setup. First we tried an Anderson timer. I have used an Anderson timers for more than 10 years and they seem fine. But on his engine there was a miss on magneto. After investigating a little, I think the wiper was slightly hitting the metal case and shorting out the magneto on a random bias. Next we tried a New Day timer for some reason this timer failed badly on his engine. The wiper would have extreme pressure on the contacts. So much so that the advance lever would move. For grins, I tried this timer on my engine and it seems to work fine. Although I noticed that with the New Day vs the Anderson I had to re-time the ignition. The Anderson had the proper ATDC setting with the lever up, yet the New Day (no adjustments to the rod) was running maybe 30 degrees BTDC with the lever up. So apparently when changing a timer you should check the ignition timing. Lastly we tried a TW timer on his engine, this timer seems to work better than the others. So...... what is the difference? I'm guessing that the wipers are positioned by the cam and gear combination. Apparently the wiper can be moved in and out depending on the cam/gear combination. Also there must be differences in the case designs of these timers, because the initial timing is different. Sounds like the timing cover is no properly centered on your friends car. With some designs, the internal contacts can be adjusted and others not. Adjusting them only changes timing of the cylinders relative to each other. Timing is primarily controlled by the position of the case relative to piston position and the travel of the case based on the length of the rod. The lengthening and shortening of the rod is really the only way to either advance or retard the initial timing setting. As is the case with any aftermarket timer, setup and understanding the principals of operation are key to getting it setup correctly the first time. Most instructions in original literature only apply to the Ford timer design or those aftermarket timers which utilize exactly the same case. I think the TW timer falls into this category. The timing cover on my �26 engine is approx. 1/16� off center. It ran reasonably well with the roller timer, when I tried an Anderson timer it had considerable differences in timing between the cylinders and ran worse than the roller timer. What were the symptoms of failure on the Truefire? Did it die completely, or was it just misfiring, like it was out of proper timing? I have found that the timing rod usually needs to be lengthened to achieve proper timing with a Truefire, sometimes enough that it is best to fabricate a custom, longer timing rod. Here is a picture of where the timer case ends up with a Truefire when the timing is at 15 degrees after top dead center. 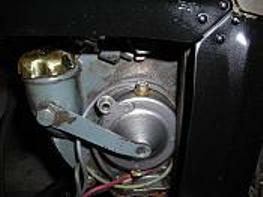 With the timing lever at the steering column all the way up, the timing rod should be lengthened until it reaches all the way over to the hole in the timer case without disturbing its setting. Thanks Mike. I hadn't heard of that failure mode before. I'm sending you a PM. Mr. Bittner's web site is still up, I don't know whether he still provides a repair service for his units. Mike, you are describing the symptoms of a cam gear that is too thick. It messes up the spacing of the rotor (front to back). There are various ways to compensate for this. For instance a special short rotor on the Anderson, or grinding the backside of the Newday rotor. The best fix however, is a cam gear of proper thickness. Please keep us posted on what you find, thanks! you can also buy the shorter nut if needed.